I made this face parts game for my son to play with on the lonnnng flight back to the UK. It is light and all the pieces fit into a resealable bag, so it is super handy for travelling. I found a variety of free face part images from sources such as Microsoft Office Clip art, PicMonkey and Clker. Then I drew a basic oval face, and resized the face parts and accessories to fit. I printed them onto white cardstock and cut out the shapes. At this point you could fire up your laminator, but as I don’t have one I covered mine with contact paper on each side. Then I cut them out again. I used Velcro Sticky Dots to position the pieces onto the face. The pieces can then be easily removed and changed. I gave them to F and I named the face parts as he looked over all the pieces. Get the FREE face part printable by heading over to the Craftulate Shop! This is adorable. I just love the idea of using velcro dots for the face parts. I’m sure my older kids (5,4,2) will enjoy this, and I can’t wait to try it with my toddler when he’s a bit bigger. Thanks for the great printable! How cute! I love your face game! This is a wonderful idea…I have been meaning to do something similar in felt but I like your idea using clipart etc and the Velcro better! Looks like he is having so much fun! This is so awesome. Thank you for the printable. My boys will love this! This is so fun!!! Thanks for sharing at For the Kids Friday! I’m featuring you at SunScholars this week! Hi! I really love this project and the parts of the face are exactly what I have been looking for. I live in Italy and occasionally teach English to Italian children. I would love to have the free printable but I do not do social media. I have neither the time nor the inclination to participate. Is there some way I could access the printable? Maybe you could email it to me? Hi Lisa sorry for the delay in replying – backlog after a long holiday! I will email the printable to you now. Love this idea – I’ve shared your site but how do I obtain the printable download of the face parts? Hi just wondering If I could have the face parts game printouts emailed to me Thanks. I can’t get this to work when I try to get the download. 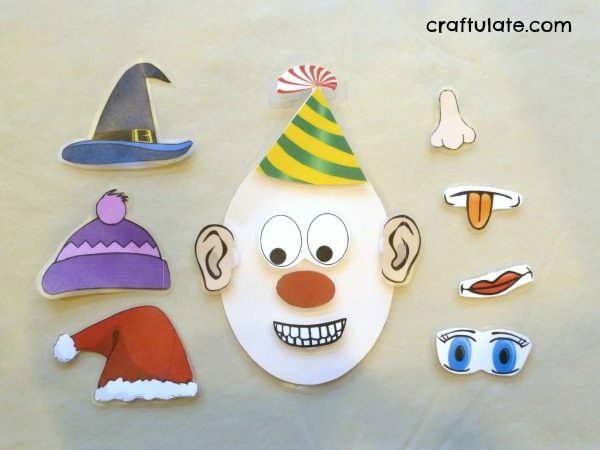 How can I get the download of the face parts game printables? Could you please emai. It to me or give me instructions? Thanks!! Are you getting a link through to the Craftulate shop? From there you just need to place it in your cart, “buy” it, and you’ll get a link to download it. Why not add some other freebies while you’re there! I’m trying to download the free items. I put the items in the cart and hit purchase but never received an e-mail with the downloads. Please advise how to get the items I selected. Sorry about that! I can see the order that you placed and have resent the confirmation email. Hopefully you’ll receive it this time! Hi there, I figured out the problem! I think there could be a software glitch with mobile access. Thanks for the prints. I have already laminated and am looking forward to the therapy session! Glad you got them, I was just looking into the issue!